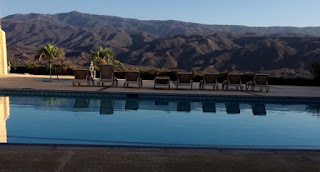 11am - I biked to the Jojoba Hills office in order begin the process for living at Jojoba Hills RV Resort. Didn't I mention to you a couple of days ago, that things were moving fast for me? Whatta you think after reading this? There are several things for me to do in order to get on the list for joining Jojoba Hills. The biggest thing is to buy an RV!! I'm thinking about a trailer, 20 to 25 feet, 1998+. Jojoba Hills has a 20 years old or newer policy. Mariner7, Ip5 and myself took off for lunch at the Stagecoach Inn. 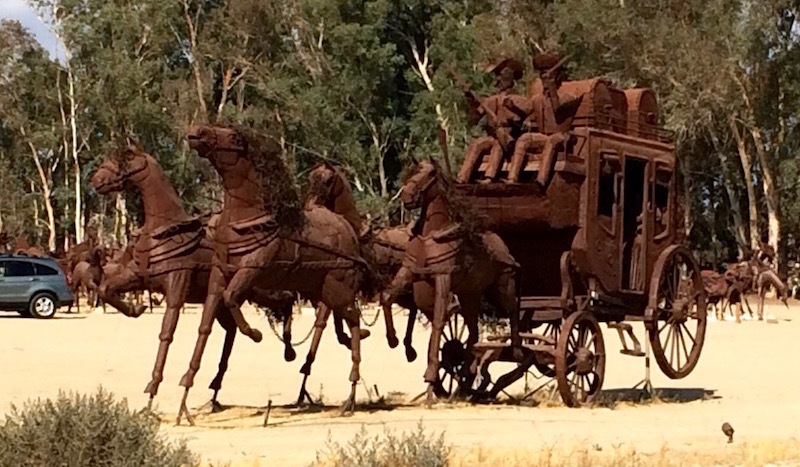 On the way, we came across a ton of sheet metal sculptures. Of course Ip5 got all crazy. She wanted sooooo much to take a pic of the old west guys on the stagecoach. So, we stopped to take that pic. 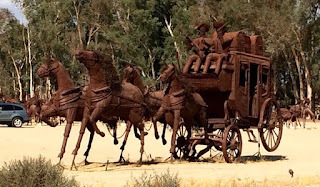 Steel sculpture stagecoach driving hard! Ip5 and myself are down at the Friendship Hall swimming pool to take some pics for you to see. This is a gorgeous place. Way up high. After Ip5 captures the pics, George plans a soak in the pool. But not until the 5 O'clock hour. George likes to do the same things at the same time each day. Wow! This is a beautiful view! As Mariner7 [electric bike] , Ip5 [iPhone] and George drove back to Site 224 where we are staying, we met Judy Bell messing with her naughty irrigation system. So, we stopped to see what was going on. Seems the irrigation system wasn't watering the right place. Judy was a little angry about it. But when we stopped to chat with her, she seemed to chill out. "Not really a big thing", Judy told us. AWESOME! good for you, George. In a few years I'll be joining Escapees for the exact same reason. You think this is an AWSOME! thing to do? I do too 😎. I know it's an awesome thing to do! Maybe we'll be neighbors in a few years! George, new adventure!!!! good on you. Thank you, Sandy. I am all high about what is going to happen over the coming year. Buy a trailer RV. Move from Guava Gardens to Jojoba Hills. Man-O-Man! It will be nice to get back into the camping lifestyle even if you are not on the move anymore. So true! Don't you just love adventures like these? I could see where this was going. Good for you George, I think you'll love it there! Thank you sooooo much Keving! You were able to see it. I, on the other hand, didn't have a clue. Then, at the "Last Friday free supper", I met Shirley. 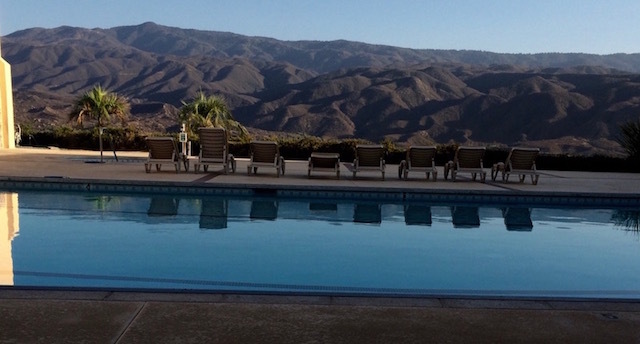 One of the first members to join Jojoba Hills RV Park. As she chatted with me, I got a fantastic perspective at what gives here. 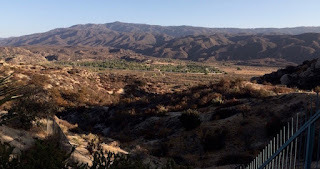 I knew right then, that I would move to Jojoba Hills ! What a great idea George. Have fun making the change. We've never looked into the Escapees - maybe we should. Would be the greatest thing, if such good friends as you two, moved to Jojoba Hills 😎. I'm betting that I love it right now!! Yes, an RV. I want to get a trailer. Judy bought a brand new 5th wheel. Gorgeous. Big. I was so hoping that you were thinking of making the move...great news with new adventures to share! I'm thinking Barbara D.'s suggestion for a possible park model is excellent. Roomy and a permanent feel; best of both worlds. We spend (hubby and I) a fair amount of time in a 17' Casita. Believe me, it gets pretty "cozy" at times. If you get the '98. What about the 20 year rule? So happy for you and your past travels truly encouraged us. Sorry. No park models here. All members must use a movable RV. I'm thinking toward a 20' to 25' trailer. Vintage, 1997+ . There are some of these near my Jojoba site. I'll take pics for you to see. Congratulations! What great news -- I think this move will be a perfect fit for you! Also, just think you will have a lot more options for a flower garden and not have to worry about water on the balcony. How exciting -- can hardly wait to see which rv you choose to live in! You hit the NAIL on the head with your comment! Congrats George and welcome to the SKP family. I'm on the waitlist right now so hopefully we will meet in the future. I'm also excited about the next stage of my adventures. Your answer [A.] looked right-on to me! I think this is a great lifestyle choice for you George. You were always comfortable in an RV so this will offer the best of all worlds, changing neighbors, a flower garden and an RV. Norma and I are very happy for you! George, you will be only 40 miles from the Julian Pie Factory in Julian, CA! Probably the best pies in the USA! Best pies in the USA. Wow! Great to know 😎. I agree with you. 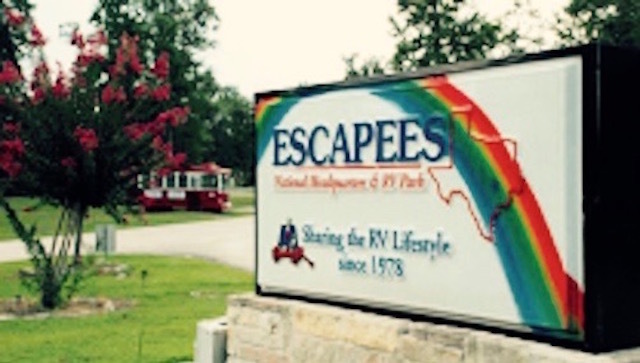 Escapee parks are a great life style. Flower garden. RV folks all around. Pool. Spa. Sauna. This really is like a fashionable private club. Only a whole lot less expensive. Not to be considered a year round residence. How long to stay there at a time. Does that mean you have to hit the road? Yes, there is a state regulation that requires RVs camping in an RV park, to vacate at the end of a six month stay. You may recall, that I had to vacate Santee Lakes RV Park when I hit six months. Went north to visit. That was during March, 2014. On my return south, on passing the City of Bakersfield, my heart's lower chamber stopped beating. The accident that followed while I was passed out, destroyed the greatest RV in the history of the World. Our own MsTioga.